It is no secret that peregrine falcons have been nesting on Derby Cathedral tower for a number of years. A nesting platform was provided for them in 2006 and the same two adults have reared young every year since then. Progress of the breeding attempt can be followed on the internet, so I knew that this year the youngsters had fledged during the middle of June. Nevertheless young peregrines stay in the vicinity of the nest for some time after fledging so I thought a visit might still be worthwhile. Last Wednesday I arrived in Derby to find no sign of the birds in the vicinity of the Cathedral. I spent a while recce-ing the area for a future visit. A good location would not be easy to find. 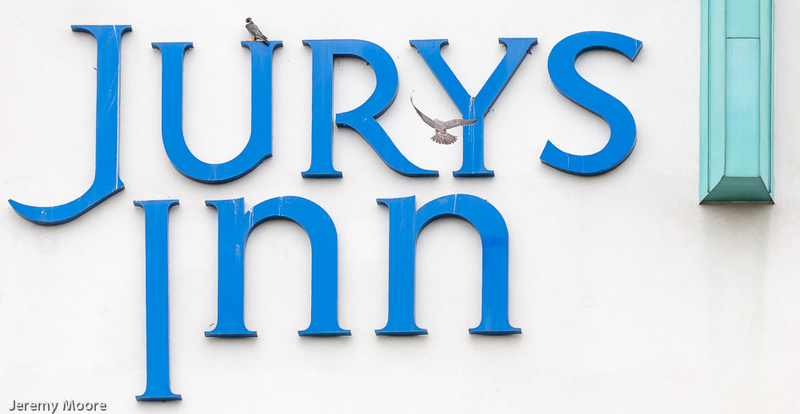 But during my wandering I had noticed a bird perched on the lettering about fifteen stories up on the side of the Jury’s Inn Hotel not far away. Without binoculars it was not possible to tell if it was a peregrine or a feral pigeon, but I knew the peregrines sometimes perched or roosted there. By early afternoon I had found my own perch – jammed in between the bridge railings and the eight-lane Derby Inner ring road as it crossed the River Derwent. Traffic screamed past just a couple of feet away from me. But I was exactly at right-angles to the side of the hotel where the bird was perching, and at about the optimum distance away. I spent an interesting afternoon there. At one point a juvenile flew from the lettering to meet one of its parents about 150 feet above my head. The adult was carrying prey – a whole bird complete with two trailing legs – and the youngster turned over underneath him/her and took the prey in mid-air. I could just hear them screaming at each other above the roar of the traffic. The youngster took the prey on to the roof of a nearby block of flats to eat it. A few minutes later a peregrine (probably the same one) arrived, carrying the remains of a bird, and circled over my head, eating from its talons like a hobby does. As an ex-RSPB species protection warden I’ve spent many weeks (months!) watching peregrines but couldn’t remember ever seeing that before. For long periods nothing at all happened. Every so often a yell would come from the passenger seat of a van as it flew past. There was a little to-ing and fro-ing as adult peregrine replaced juvenile on the lettering and vice versa. At one point the juvenile appeared to fall asleep with its chin on the letter “r” and its feet stretched out behind it! I pondered over the thought that these young peregrines would regard their urban surroundings as completely normal while their coastal cousins might find them absolutely abhorrent if they were to encounter them. It was not a particularly challenging scene to photograph. 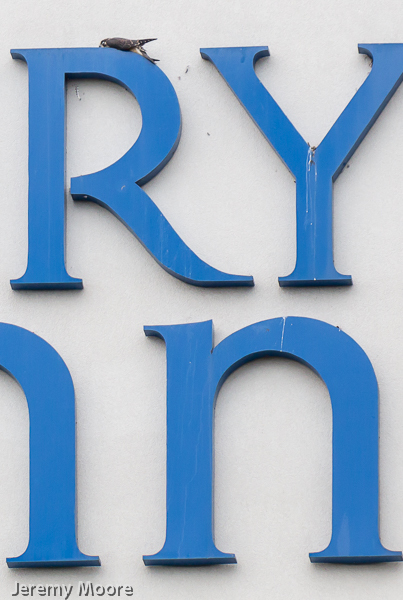 I wanted to include the lettering as the environment within which these urban raptors lived their lives, so I set up the Canon 5d3 with long telephoto on a tripod and trained it on the side of the hotel. I would need to use the perspective control tools in Lightroom to try to disguise the upwards angle at which the images were taken, so I zoomed out a fair way to allow for the cropping that would come with it. I also needed to remember that the meter reading would need to be over-ridden to account for the largely white subject matter – in this case by about one stop, although had the side of the building been lit by the sun at least two stops would have been required. Probably the most important thing I needed was a great deal of patience, and in this case, by the side of the Derby inner ring-road – a slightly thicker skin than normal. To follow Tales from Wild Wales scroll right down to the bottom of the page and click Follow. This entry was posted in Uncategorized and tagged derby, Derby Cathedral, peregrine falcons, peregrines, photographing, urban, wildlife. Bookmark the permalink.